Proper storage is the final detail that goes into all the time and effort it takes to bake a cake. Most cakes are delicate, and without proper storage, they tend to dry out or even start to go stale overnight. Short-term cake storage isn’t as tricky as long-term storage, which usually requires wrapping the cake well and freezing it. To keep leftover cake tasting as good on the second day as it did the first, store it based on the requirements for its most perishable ingredients. Wrap a plain, unfrosted cake tightly in one layer of plastic and store it at room temperature for up to five days. The cake should be completely cool before you wrap it to avoid damaging condensation. 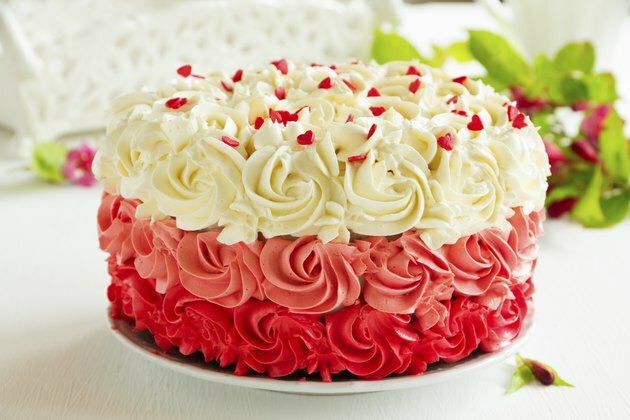 Store a cake that’s frosted and filled with nonperishable ingredients, including jam filling and frosting made from sugar and vegetable oil, at room temperature. Set it on a cake plate and cover it with a dome that’s big enough to clear the frosting. As an alternate, set the plated cake inside a container with a tight-fitting lid that is large enough to accommodate the cake without touching it. Set a cake made with perishable frosting and filling, such as those that contain eggs, dairy products and fresh fruit, on a domed cake plate or in an air-tight container in the refrigerator. Perishable ingredients are prone to develop mold when left out. Once the frosting becomes firm, drape the cake loosely with plastic wrap, replace the dome and store it in the refrigerator overnight. Remove the plastic and allow the cake to come to room temperature before serving it, or it will be more fragile and less flavorful. Store a buttercream-frosted cake on a domed cake plate or in an airtight container in a cool or room-temperature environment for up to a day. If the cake is in a warm environment, refrigerate it on a domed plate until the frosting is firm. Then drape it loosely with plastic wrap, replace the cover and place it in the refrigerator. The cake will keep for up to five days. Wrap fully cooled cheesecake in a double layer of plastic and set the wrapped cake on a plate in the refrigerator. Store cakes topped with meringue in an airtight container at room temperature for up to three days. If you don’t have a domed cake plate or a large-enough container with a tight-fitting lid, improvise by setting your cake on a large plate and covering it with an inverted bowl. If the cake is frosted or glazed, the bowl should be big enough to clear the sides and top of the cake. Generally, cakes with less butter dry out faster than those with more butter. Most cakes stay fresh under a dome for about three days.